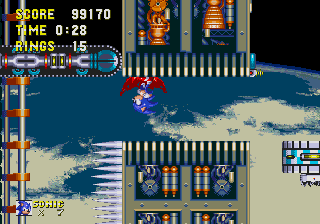 Death Egg Zone from Sonic & Knuckles is an example of the Death Egg theme. How is he even breathing? Levels with the Death Egg theme are set deep in outer space fortresses and occur near the end of games in the Sonic series. This theme first appeared in Death Egg Zone in Sonic the Hedgehog 2. The Death Egg: fearsome overlord of the heavens; a vindictive, killing moon, testament to both the grandiose malice and grandiose megalomania of Doctor Ivo Robotnik. The iconic final stronghold of the early Genesis games could strike fear into the hearts of even the most hardened Sonic players, forming the backbone of the epic Death Egg Saga. Since Sonic the Hedgehog 2, Dr. Eggman (along with other assorted supervillains) seems to have developed a taste for orbital fortresses, no matter how many times a thousand miles of vacuum proves insufficient defence from Sonic and pals. How the world has avoided Kessler syndrome, considering all the smashed bases floating around up there, is anyone's guess. Still, the space stations keep coming, and Robotnik shows no sign of losing interest in zero-g hideouts. Levels making use of the Death Egg theme often comes paired with an outer space-themed level. Pages in category "Levels with a Death Egg theme"
This page was last edited on 31 October 2017, at 19:31.